I've been holding onto these guys for a few weeks now, and I finally got some time to sit down and swatch all of them for you. 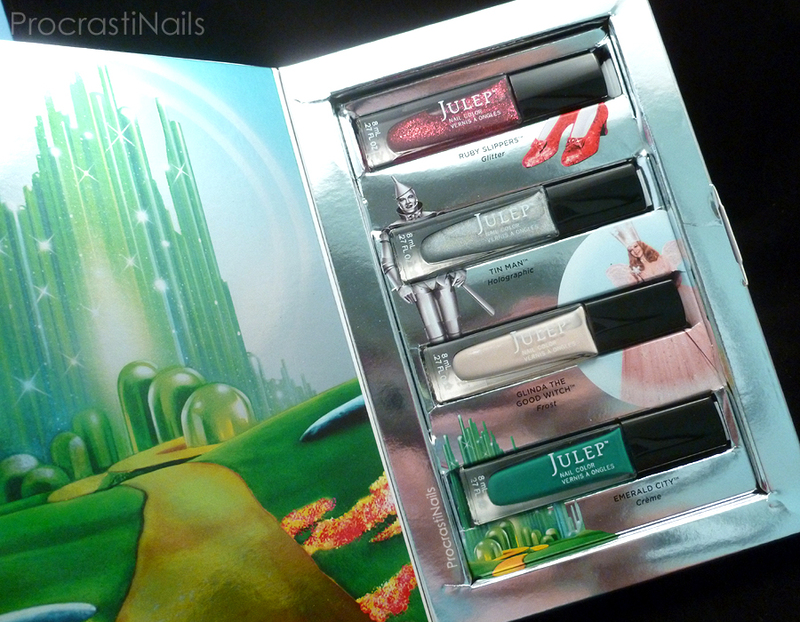 Julep released this set as a QVC Exclusive last fall for the Wizard of Oz's 75th Anniversary, and at the time they told us there was no plans to release the set through the Julep.com website. This made a lot of Mavens upset because it was such a pretty set, so you can imagine how excited people were when it showed up in the Secret Store this year! 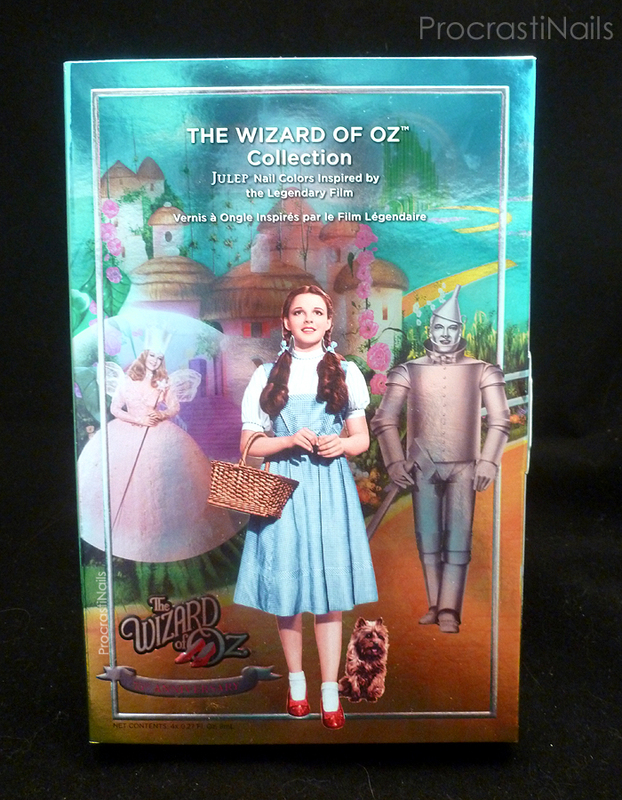 You may have heard that I'm not a huge fan of the Wizard of Oz (and if you hadn't then you have now!) so even with all the hype I was only mildly excited when I picked this up. When I got the set in my hands I was a bit more excited (especially when I saw how holographic Tin Man was), but my OHMYGOSH THESE ARE GORGEOUS feelings didn't hit until I was able to swatch them. These are exactly the types of colours I love, and they all look lovely with my skin tone. I think this is my favourite set that Julep's ever put out! :) Let's take a closer look. I want to start off with taking a closer look at this gorgeous packaging. When I showed this set to my friends the first thing they commented on was the packaging. This collection came in it's own foiled decorative box and as you can see it is stunning! 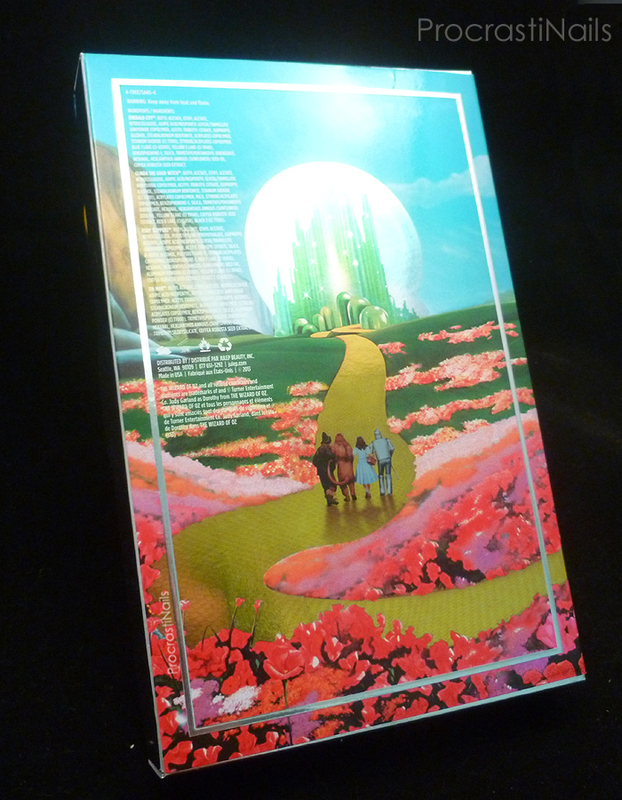 The amount of detail and effort put into the box is obvious, and I love that they put all the elements from the collection on the cover - the slippers, the Tin Man, Glinda, and a peek of Emerald City in the distance. And the inside is just as lovely as the outside! As you can see they pulled the elements from the cover to accent the polishes. They put so much detail into the box that I'm having trouble trying to decide if I want to add the polish into my normal collection or leave it separate in this box so that it doesn't go to waste! Now let's look at the polishes themselves! Julep Ruby Slippers is described as a "full-coverage red multidimensional glitter" and before I tried it on my nails I was worried it was going to be too similar to China Glaze Ruby Pumps. Thankfully my fears were unfounded; where Ruby Pumps is a red jelly polish with glitter throughout, Ruby Slippers is made up from red glitters in a clear base. Ruby Slippers is also a bit a bit less rich in colour than Ruby Pumps. Just like most of Julep's other "full-coverage" glitters, this is really only full coverage if you use really thick coats or do 4+ regular coats. 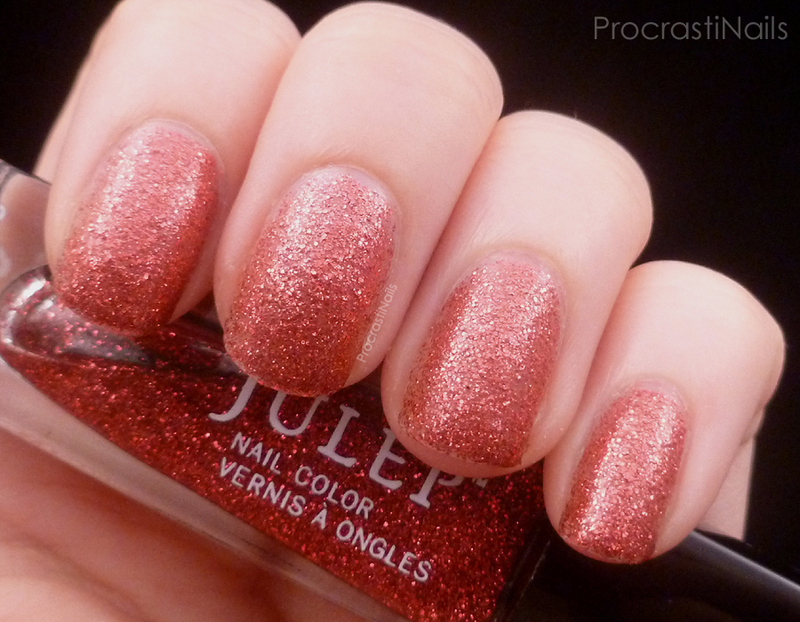 I don't know why Julep is still using clear bases for their glitter polishes when a tint of colour would make them perfect. What you see here is three and a half coats (I did an extra coat on the tips to cover my nail line) and in real life it's still not fully opaque. Kind of disappointing, but not unexpected. Another thing I found interesting was that this dries pretty matte. I actually really like that about it, since it reminds me more of the matte sequined ruby slippers you see with lots of Dorothy costumes. I could probably take this time to make a cheesy comment about tapping my nails together but I'm going to pass on that one. Haha. Tin Man is described as a "silver holographic" and this is hands down the best polish from the set. I have yet to master photographing holo polishes (and there isn't enough sunlight in these parts to rely on that), but trust me when I say this is a stunning linear holo polish. 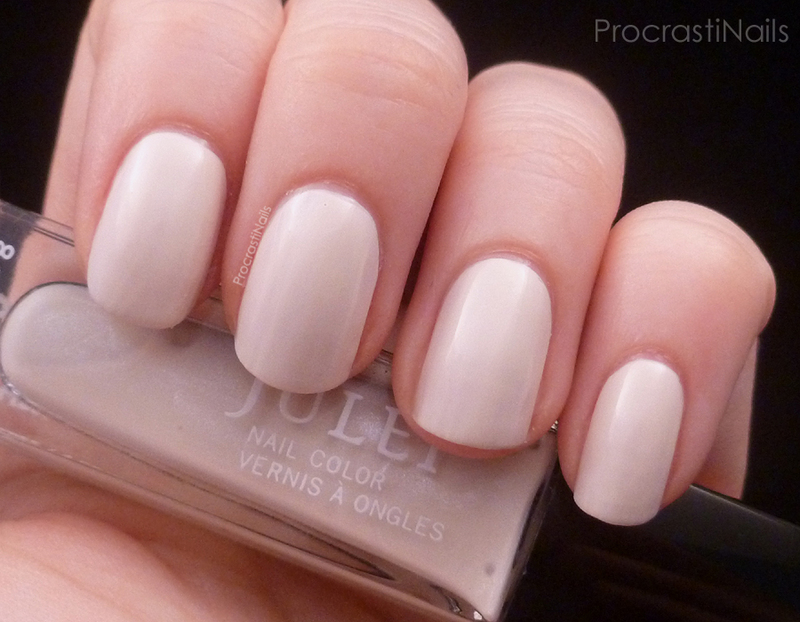 Julep needs to do more of these because they've just shown me they can do this finish and they can do it well! This polish also applied flawlessly: what you see here is three coats but it would have been fine with two. I don't have much experience with holo polishes (this is one of two that I own) so I don't know if they're always this opaque, but the formula in this polish is great either way. And below is a shot I took for instagram when I first got this polish... The sun was out that day, so you can see a bit of the holo coming through! Glinda the Good Witch is the most "me" shade from this set. It's described as a "pink frost" and while you can see some of the frosty shimmer in the bottle it doesn't really translate onto the nail. That being said it's still a lovely neutral pink, and I'm sure I'll get a lot of wear out of it. This polish applied pretty easily. The first coat was a bit streaky but the second and third coats cleared that right up. I used two coats for these pictures, but Emerald City is one of those amazing polishes that can be worn out the door with just one coat in a pinch! And here's a look at all of the shades together, because everyone loves a good collage! 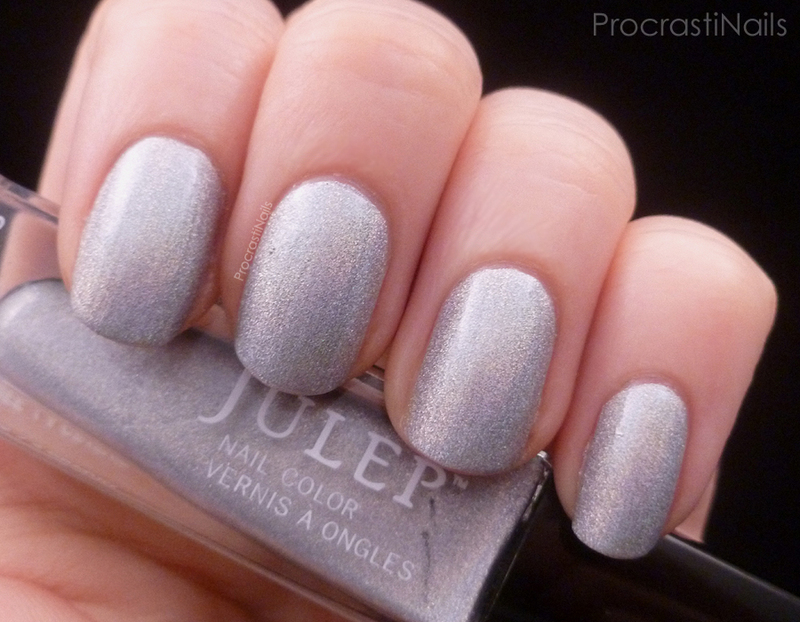 The main knowledge I'm taking from this set is that Julep really needs to start doing more linear holo's. Holographic polishes are so popular in the nail community right now and Julep has shown they have the ability to make them, so they need to get on that and get on it fast. 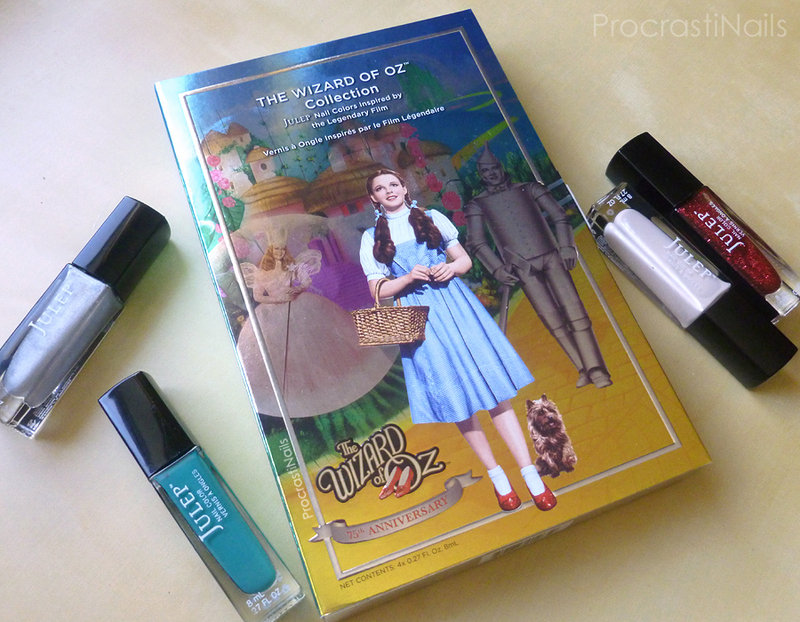 The 75th Anniversary Wizard of Oz Collection is still available on Julep.com, and it's currently priced on sale at $19.99. If you're a Maven then shipping is also free. I totally think this set is worth it (and regular price is $56) so if you want to grab this I'd suggest you do it now before the price goes back up! Phew, this was a really long post! Hope you guys enjoyed, and let me know what you think about this set, okay? What a fun collection! Love the box the polishes came in. Its cute and the colors seem nice too. Great swatches and review! They're all so pretty! <3 I'd totally keep them in that box, just look at it haha Ruby Slippers has to be slightly disappointing one (how do you wear four coats of glitter?! Must be a pita to remove!) but I bet it looks amazing over Ruby Pumps. I love the box, and yeah I hate removing Julep's "full coverage" glitter because you need to build them up so much when you wear them. I got their glitter removal kit on order so I'm excited to see if that's a tidier removal than my current saturated-cotton-ball technique. Do you have Rebel? How does Tin Man compare to that one, if so?